Co wrote with Dr. Fred T. Davies and first appeared in Singularity Hub. In the next 30 years, virtually all net population growth will occur in urban regions of developing countries. At the same time, worldwide food production will become increasingly limited by the availability of land, water, and energy. These constraints will be further worsened by climate change and the expected addition of two billion people to today’s four billion now living in urban regions. Meanwhile, current urban food ecosystems in the developing world are inefficient and critically inadequate to meet the challenges of the future. Combined, these trends could have catastrophic economic and political consequences. A new path forward for urban food ecosystems needs to be found. But what is that path? New technologies, coupled with new business models and supportive government policies, can create more resilient urban food ecosystems in the coming decades. These tech-enabled systems can sustainably link rural, peri-urban (areas just outside cities), and urban producers and consumers, increase overall food production, and generate opportunities for new businesses and jobs (Figure 1). to servicing end customers in urban and peri-urban markets. Here’s a glimpse of the changes technology may bring to the systems feeding cities in the future. A technology-linked urban food ecosystem would create unprecedented opportunities for small farms to reach wider markets and progress from subsistence farming to commercially producing niche cash crops and animal protein, such as poultry, fish, pork, and insects. Meanwhile, new opportunities within cities will appear with the creation of vertical farms and other controlled-environment agricultural systems as well as production of plant-based and 3D printed foods and cultured meat. Uberized facilitation of production and distribution of food will reduce bottlenecks and provide new business opportunities and jobs. Off-the-shelf precision agriculture technology will increasingly be the new norm, from smallholders to larger producers. As part of Agricultural Revolution 4.0, all this will be integrated into the larger collaborative economy—connected by digital platforms, the cloud, and the Internet of Things and powered by artificial intelligence. It will more efficiently and effectively use resources and people to connect the nexus of food, water, energy, nutrition, and human health. It will also aid in the development of a circular economy that is designed to be restorative and regenerative, minimizing waste and maximizing recycling and reuse to build economic, natural, and social capital. In short, technology will enable transformation of urban food ecosystems, from expanded production in cities to more efficient and inclusive distribution and closer connections with rural farmers. Here’s a closer look at seven tech-driven trends that will help feed tomorrow’s cities. Connectivity from simple cell phone SMS communication to internet-enabled smartphones and cloud services are providing platforms for the increasingly powerful technologies enabling development of a new agricultural revolution. Internet connections currently reach more than 4 billion people, about 55% of the global population. That number will grow fast in coming years. These information and communications technologies connect food producers to consumers with just-in-time data, enhanced good agricultural practices, mobile money and credit, telecommunications, market information and merchandising, and greater transparency and traceability of goods and services throughout the value chain. Text messages on mobile devices have become the one-stop-shop for small farmers to place orders, gain technology information for best management practices, and access market information to increase profitability. Hershey’s CocoaLink in Ghana, for example, uses text and voice messages with cocoa industry experts and small farm producers. Digital Green is a technology-enabled communication system in Asia and Africa to bring needed agricultural and management practices to small farmers in their own language by filming and recording successful farmers in their own communities. MFarm is a mobile app that connects Kenyan farmers with urban markets via text messaging. Gaining access to credit and executing financial transactions have been persistent constraints for small farm producers. Blockchain promises to help the unbanked access basic financial services. The Gates Foundation has released an open source platform, Mojaloop, to allow software developers and banks and financial service providers to build secure digital payment platforms at scale. Mojaloop software uses more secure blockchain technology to enable urban food system players in the developing world to conduct business and trade. The free software reduces complexity and cost in building payment platforms to connect small farmers with customers, merchants, banks, and mobile money providers. Such digital financial services will allow small farm producers in the developing world to conduct business without a brick-and-mortar bank. Blockchain is also important for traceability and transparency requirements to meet food regulatory and consumer requirement during the production, post-harvest, shipping, processing and distribution to consumers. Combining blockchain with RFID technologies also will enhance food safety. Uberized services can advance development of the urban food ecosystem across the spectrum, from rural to peri-urban to urban food production and distribution. Whereas Uber and Airbnb enable sharing of rides and homes, the model can be extended in the developing world to include on-demand use of expensive equipment, such as farm machinery, or storage space. This includes uberization of planting and harvesting equipment (Hello Tractor), transportation vehicles, refrigeration facilities for temporary storage of perishable product, and “cloud kitchens” (EasyAppetite in Nigeria, FoodCourt in Rwanda, and Swiggy and Zomto in India) that produce fresh meals to be delivered to urban customers, enabling young people with motorbikes and cell phones to become entrepreneurs or contractors delivering meals to urban customers. Another uberized service is marketing and distributing “ugly food” or imperfect produce to reduce food waste. About a third of the world’s food goes to waste, often because of appearance; this is enough to feed two billion people. Such services supply consumers with cheaper, nutritious, tasty, healthy fruits and vegetables that would normally be discarded as culls due to imperfections in shape or size. We need to change diet choices through education and marketing and by developing tasty plant-based substitutes. This is not only critical for environmental sustainability, but also offers opportunities for new businesses and services. It turns out that current agricultural production systems for “red meat” have a far greater detrimental impact on the environment than automobiles. There have been great advances in plant-based foods, like the Impossible Burger and Beyond Meat, that can satisfy the consumer’s experience and perception of meat. Rather than giving up the experience of eating red meat, technology is enabling marketable, attractive plant-based products that can potentially drastically reduce world per capita consumption of red meat. Lab-grown meat, literally meat grown from cultured cells, may radically change where and how protein and food is produced, including the cities where it is consumed. There is a wide range of innovative alternatives to traditional meats that can supplement the need for livestock, farms, and butchers. The history of innovation is about getting rid of the bottleneck in the system, and with meat, the bottleneck is the animal. Finless Foods is a new company trying to replicate fish fillets, for example, while Memphis meats is working on beef and poultry. 3D printing or additive manufacturing is a “general purpose technology” used for making, plastic toys, human tissues, aircraft parts, and buildings. 3D printing can also be used to convert alternative ingredients such as proteins from algae, beet leaves, or insects into tasty and healthy products that can be produced by small, inexpensive printers in home kitchens. The food can be customized for individual health needs as well as preferences. 3D printing can also contribute to the food ecosystem by making possible on-demand replacement parts—which are badly needed in the developing world for tractors, pumps, and other equipment. Catapult Design 3D prints tractor replacement parts as well as corn shellers, cart designs, prosthetic limbs, and rolling water barrels for the Indian market. Urban food ecosystem production systems will rely not only on field-grown crops, but also on production of food within cities. There are a host of new, alternative production systems using “controlled environmental agriculture.” These include low-cost, protected poly hoop houses, greenhouses, roof-top and sack/container gardens, and vertical farming in buildings using artificial lighting. Vertical farms enable year-round production of selected crops, regardless of weather—which will be increasingly important in response to climate change—and without concern for deteriorating soil conditions that affect crop quality and productivity. AeroFarms claims 390 times more productivity per square foot than normal field production. CRISPR is a promising gene editing technology that can be used to enhance crop productivity while avoiding societal concerns about GMOs. CRISPR can accelerate traditional breeding and selection programs for developing new climate and disease-resistant, higher-yielding, nutritious crops and animals. Plant-derived coating materials, developed with nanotechnology, can decrease waste, extend shelf-life and transportability of fruits and vegetables, and significantly reduce post-harvest crop loss in developing countries that lack adequate refrigeration. Nanotechnology is also used in polymers to coat seeds to increase their shelf-life and increase their germination success and production for niche, high-value crops. The next generation “urban food industry” will be part of the larger collaborative economy that is connected by digital platforms, the cloud, and the Internet of Things. 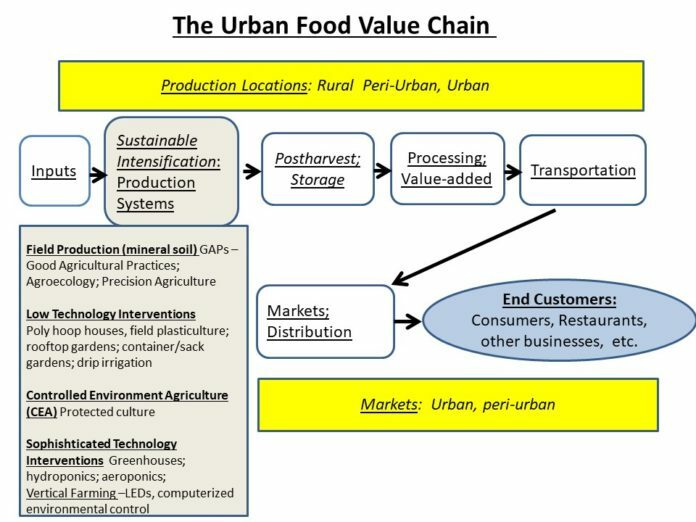 A tech-enabled urban food ecosystem integrated with new business models and smart agricultural policies offers the opportunity for sustainable intensification (doing more with less) of agriculture to feed a rapidly growing global urban population—while also creating viable economic opportunities for rural and peri-urban as well as urban producers and value-chain players. Dr. Fred T. Davies is Regents Professor Emeritus, Senior Borlaug Fellow in Horticulture, Texas A&M University; Senior Science Advisor and Jefferson Fellow, USAID; and past President, American Society for Horticultural Sciences.